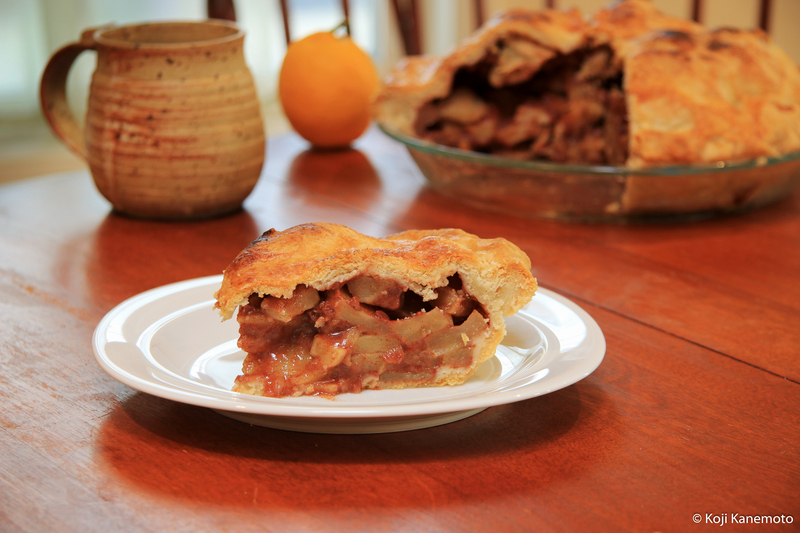 Well, throwing together my (somewhat edible) apple pie from scratch has become a piece of cake. Or is it pie? While my culinary and photographic skills pale in comparison to many others – like madlyinlovewithlife, for example – I’ve been asked about my recipe so here goes. BTW, most of this is from Cook’s Illustrated and Cathy Thomas Cooks. Yes, I shuddered myself to death the first time I tried it. When I baked my first one, it ended up looking more like marshmallows lined with the Pillsbury dough boy’s inflated life jacket but it, well, tasted OK. But since then, I’ve lost my fear of it and since my counter-top skills are marginal, I cheat. 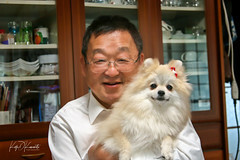 Process for up to ten seconds; I like to do it in several pulses. It should look like cottage cheese curds with no uncoated flour. Scrape sides and bottom with spatula. Add remaining 1/2 cup flour and pulse up to six times. Empty into large mixing bowl. Sprinkle in about 1/2 of the cold water/vodka, spreading it evenly. Fold over the dough mixture a bit then add remaining liquid. Keep folding mixture over until it pretty much forms a ball. It should be pretty tacky. 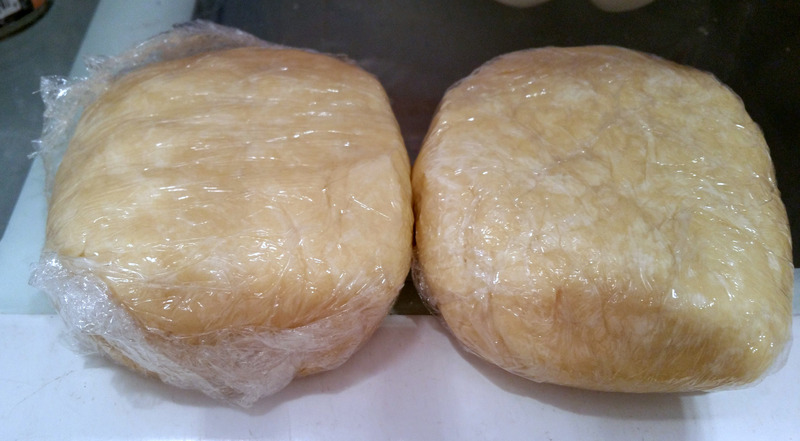 Wrap up in plastic wrap and form it quickly into a disc about 4+” wide. Refrigerate. Repeat for second batch. Chill for about an hour. Wrapped up dough for crusts. As in her recipe, I use five of those luscious, good-sized Granny Smiths you can buy at Costco. If you buy them at a supermarket, you may have to use a bit more than six. Anyways, after peeling, core then cut into quarters lengthwise; then, cut into 1/4″ thick slices. Place into LARGE, deep mixing bowl. After doing all five, pour in lemon juice and filling mix, using spatula to coat. (Note: per Cook’s Illustrated, the browning of the cut apple slices is harmless for this short period.) Set aside and quickly before your own Little Cake Boss sticks a finger into the bowl to steal a lick. If you’re real good at peeling and cutting, you can do this after you roll out the dough and while it is being refrigerated. 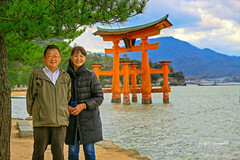 The fun part – and where I get to cheat! I got the idea from Cook’s Illustrated and modified it a bit. 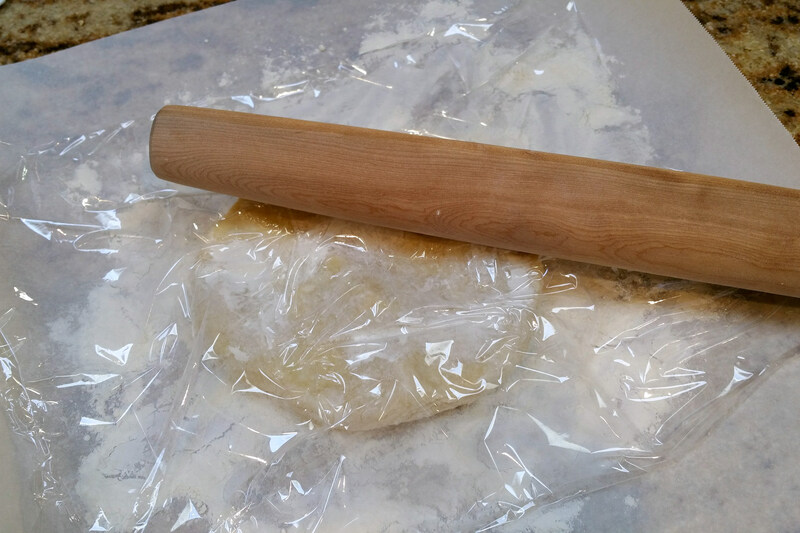 If the dough has been in the refer a while, you may need to let it rest for a bit; you’ll never be able to roll it out. But don’t wait too long. It needs to be cold. Now the cheating. Instead of your bare counter top, lay out a sheet of parchment paper, about 15″ long. Dust liberally with flour. Place one disc on center, again dusting the top generously, then cover with a similar length of plastic wrap. Evenly pound disc to get it started. 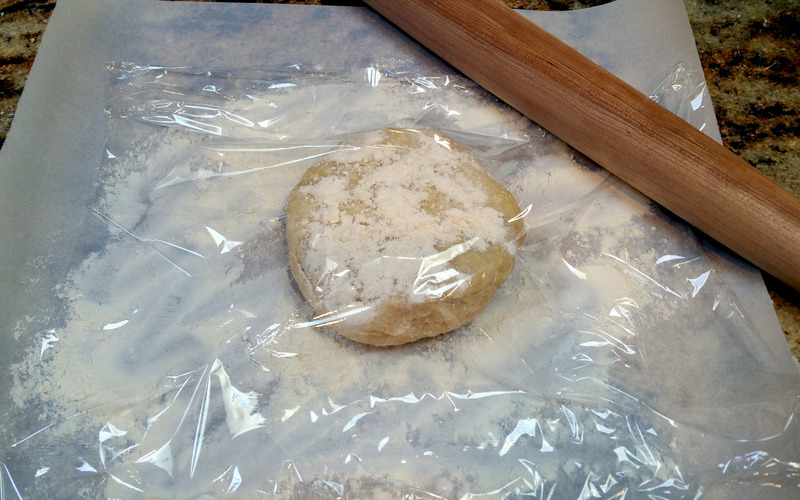 Place on flat baking sheet and put in refrigerator. Repeat for other crust. Now turn on your oven to at least 450F (My Breville only goes up to 450F). Put in a baking sheet to preheat it. It helps brown the bottom of the crust in the Pyrex pie dish. Also, whisk up one egg white for a wash.
You gotta work fast but this is the fun part. The fruit of your labor. I know. Bad pun. 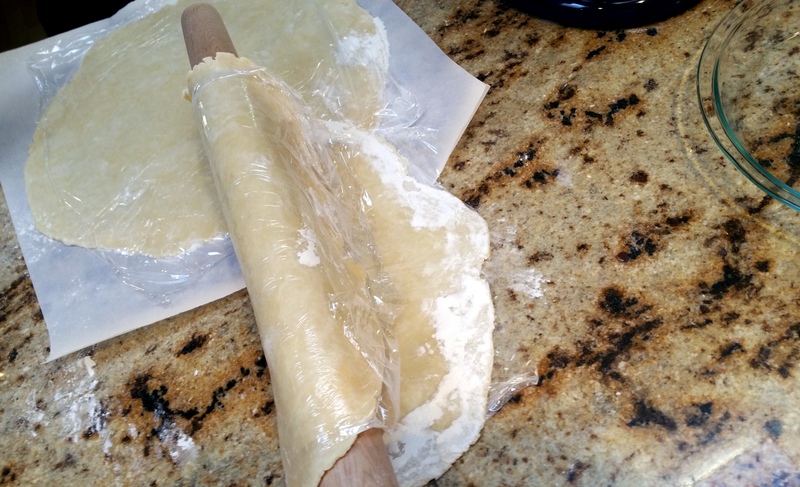 Dough flipped onto the roller. Easy! Then just lay it onto your Pyrex pie dish. 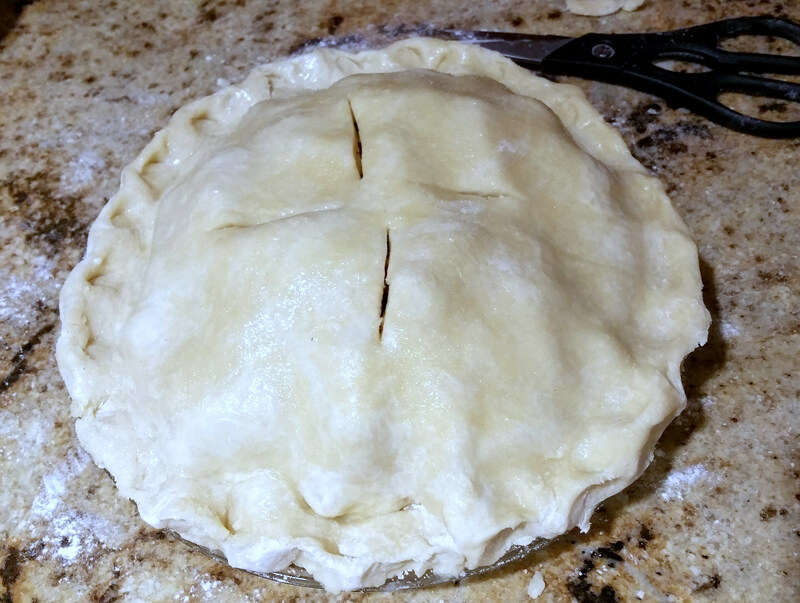 Gently press down on the dough onto the pie dish (especially the corners and sides) while supporting the outside portion of the dough with your other hand. REFRIGERATE once again for at least ten minutes to keep the dough chilled. Otherwise, it becomes a tacky mess. 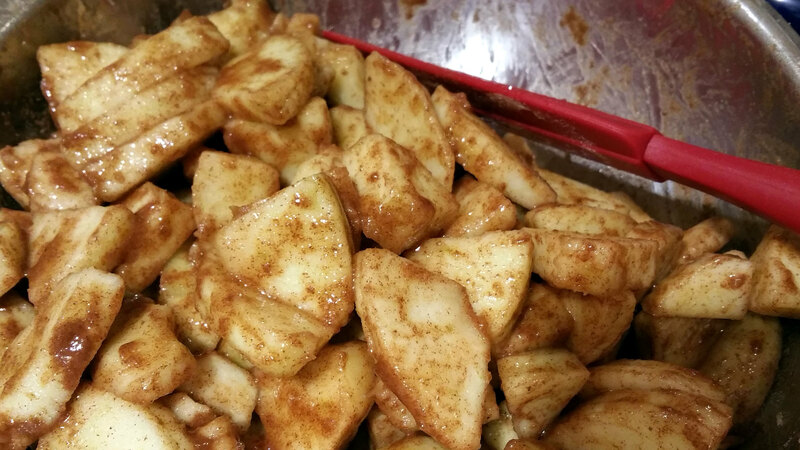 After chilling, remove the dish from the fridge then pour in the apple slices. You will need to use your fingers to move the slices around to make a nice mound. 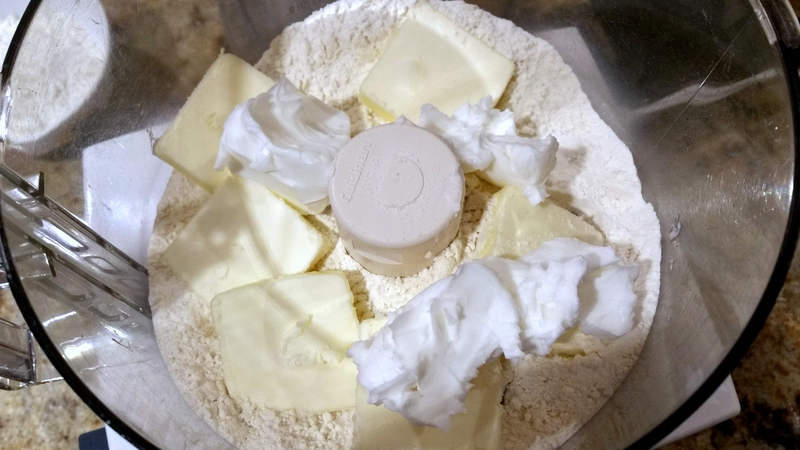 Remove the other refrigerated dough from the fridge and do the same thing to lay it across the roller…but laying it onto the filling is an adventure each time. 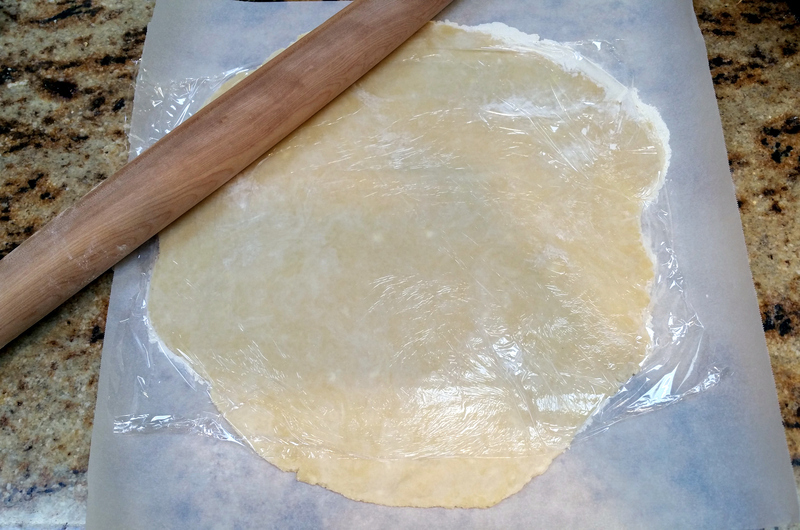 Working quickly, trim the excess dough off the pie, leaving maybe 3/4″ all around. 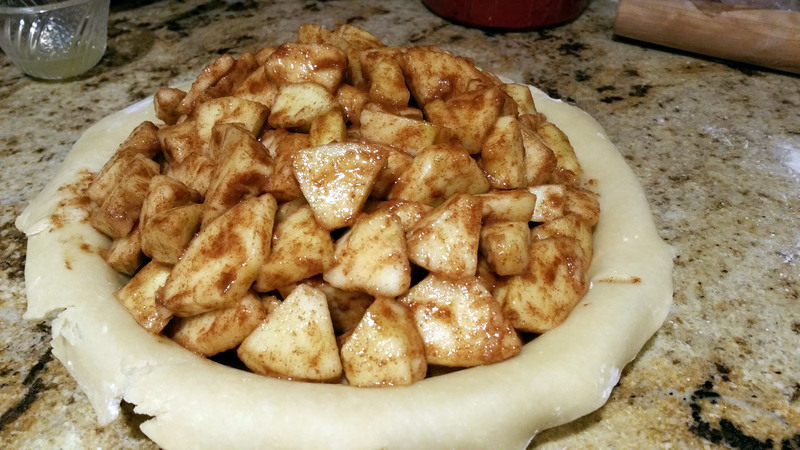 Roll the edges under each other while pressing down against the lip of the pie dish. Continue around the circumference. I’m definitely not good at it either but with your right thumb and index finger forming a V, press the dough with your left index finger into the V to “flute” it. I think that’s what you call it. You’re almost done! Brush on the egg white onto the top and the edges. Dust with sugar if you like then make four slits radiating out from the center. Put the pie in on top of the preheated cookie sheet then turn down the temp to 425F. Turn the pie after 35 minutes then lower the temp down to 375F. Important! Bake for an additional 30 to 35 minutes or until browned. Set onto cooling rack. Cool for at least several hours and enjoy!